If you’re thinking about renovating a master bathroom, do you know what colors you want in the new space? We’re betting there’s at least a one-third chance you’re considering painting your walls gray. The 2017 U.S. Houzz Bathroom Trends Study asked more than 1,200 homeowners who were planning, were in the midst of or had recently completed a master bathroom project about their preferred styles and finishes. Here’s what they said. This dream bathroom with gray walls falls into the contemporary design category. Contemporary spaces lead the pack. A whopping 90 percent of renovating homeowners changed the style of their bathrooms during an upgrade, according to the survey. Of that group, renovators chose contemporary style (25 percent), followed by transitional (17 percent), modern (15 percent) and traditional (13 percent). Style preferences vary by age. 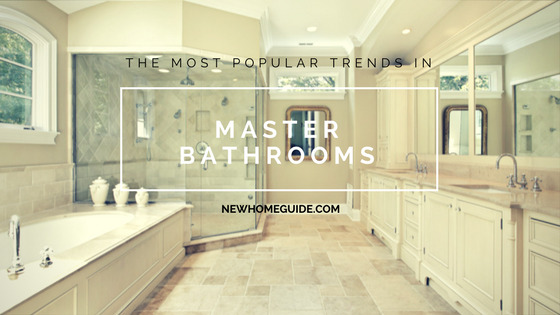 Contemporary was the most popular style for renovated master bathrooms among renovators ages 35 and up, while those ages 25 to 34 chose modern style more often. Neutral walls stay in the lead. Neutrals still reign when it comes to wall color. Gray was the top choice for the dominant color, chosen by 35 percent of renovating homeowners, followed by white (19 percent) and beige (18 percent). White cabinets come out on top. White was the top choice for cabinetry color in renovated master bathrooms, according to the survey, with 38 percent of renovating homeowners choosing it as the dominant cabinet color. Fourteen percent chose gray, while 13 percent chose medium wood tones. White also reigns in countertops. White was also popular for countertops, with 40 percent of renovating homeowners choosing white, followed by 19 percent who selected multicolored counters as the dominant countertop color. Neutral floors are most popular. The single most popular dominant color for renovated master bathroom floors was gray, selected by 31 percent of respondents. Beige took the second slot, with 18 percent of master bathroom renovators reporting it as the dominant floor color. Ceramic and porcelain are favorites for bathroom floors. For the main floor area in master bathrooms, renovating homeowners often chose ceramic or porcelain tile; 63 percent of respondents selected this option. Natural stone was the next most popular option, with marble, travertine and slate the top picks. The figure in green here and in the next two charts is the percent of renovating homeowners who chose natural stone. Respondents could select more than one flooring material, and some selected more than one natural stone. And for shower floors. What’s popular for the bathroom floor is also popular for the shower floor. And for shower walls as well. The same materials that are trending for bathroom and shower floors are also popular for shower walls — evidence that renovating homeowners often like a continuous look for their materials throughout their master baths. The 2017 U.S. Houzz Bathroom Trends Study was fielded between June 6 and Aug. 7, 2017.